I’m not entirely sure whether the potatoes will go the way of their predecessors (week 1: rosemary-garlic french fries; week 2: hash browns), but both are really winning formulas. The squash may get roasted, or turned into risotto, or roasted and then turned into risotto…it’s all pretty open right now. And, as always, I’ll post the cost comparison after I’ve had the chance to go to the grocery store. I’m not sure that I’ve ever seen Italian eggplant or rainbow carrots at my grocery store, so this one may get a little tricky. Just as this gives me a chance to explore new foods, it also gives me an opportunity to test out the variety of what’s in my grocery store. They haven’t been beaten by the CSA on variety yet. Yet. Of course, there’s always the question of quality. The CSA carrots have been quite good thus far (although the ones that my sister has shared from her CSA have been even sweeter), and the corn hasn’t been as good as the stuff from our local farmstand. Still, comparing CSA to CSA to farmstand (that has its own CSA) is really not the right comparison. Comparing the quality to the stuff from the grocery store, I can say that the tomatoes have been more flavorful, and that’s one area where flavor can be hard to come by in the grocery store varieties. The Macs have been as good as what we get from the orchard, and they are comparable to those from the grocery store (we’re lucky enough to have plenty of local orchards to supply our grocer). In other words, what I’m seeing (and tasting) is a variably better product at a better price. So far. Whether or not all of that holds up as we go through the remaining 5 weeks, I’m not quite sure. But, so far I’ve been very pleased with what we’ve gotten, and I love picking up my box o’veggies every Friday afternoon. For a person who used to hate vegetables as a kid, I think that’s a pretty fantastic thing! This entry was posted in locavore and tagged CSA, eat local, fruit, locavore, vegan, vegetables by crunchymetromom. Bookmark the permalink. For the eggplant: what are your feelings about baba ghanouj? And for the radishes: if you don’t like their sharp, bitter taste, I recommend tossing them into stew, where they’ll mellow out considerably. BTW, the reason my winter carrots taste so sweet is that by then the CSA has been storing them for a few weeks in their root cellar. The longer the carrots are stored in cold temperatures, the more of their starch turns to sugar. I am so ready for acorn squash, I hope I get it soon from my food co-op. I made a wild rice, sausage, and Asian pear stuffing for my acorn squash last year and I really want to do it again. I’m interested to see what you do with the eggplant. I like eggplant, but always struggle with how to cook it. I love seeing what other folks are getting in their CSA deliveries! We’re moving into the autumn season next week, and I can’t wait to see what we get. I, like you, didn’t like eggplant growing up (or even as an adult…), but with our CSA we had to figure out great ways to cook it. Our two favorites so far are: brushed with olive oil and crushed garlic, and then grilled or broiled and in caponata. Caponata is an Italian eggplant, tomato, garlic, and caper sauce that you can use on bruschetta or over pasta or eggs… it’s quite versatile and we all really like it. Baba ghanouj is great too. 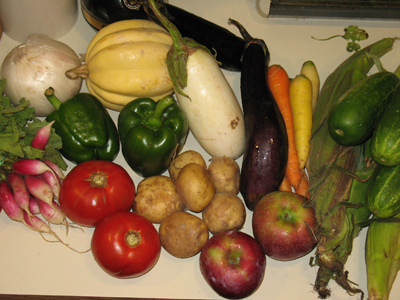 I’m glad I found your blog – I’m looking forward to hearing more about what you do with your CSA!